Does bullying happen more often than adults know? This article shares important insights to never assume that adults know about the bullying, along why it’s so important to tell or report. The first thing to understand is that while the different types of bullying—physical, verbal, emotional, or cyber—are all hurtful, most bullying harms young people emotionally rather than physically, making it harder for adults and your peers to identify both the bullying itself and its impact. For example, the casual observer may not recognize the emotional and verbal bullying including intimidation, manipulation, gossip, rumors, threatening to reveal secrets, or social exclusion as bullying because they don’t have full knowledge or access to the nuances, context, or social structures behind the behavior, such as cliques or inside jokes. It’s also difficult to know from the outside how this behavior is affecting a person’s psyche or self-esteem, as even someone who is looking closely may not recognize the emotional upheaval created by bullying because kids so often keep their emotions guarded and don’t reveal what they are truly feeling. Most kids have received the message loud and clear that if they bully, and a teacher or parent knows about it, they will be held accountable. Which leads to the question, who is actually going to willingly bully in front of teachers or parents? The answer is very few, unless maybe they want to get caught or just don’t care. So then, how does bullying happen? It most often occurs with whispered words, through gossip or rumors told from person to person. It happens in dark corners of hallways, on the school bus, and places where no adults are present. In addition to kids bullying outside the view of adults in the physical world, it’s especially true online. Kids are hanging out in places that adults don’t have access to, like group chats, gaming platforms, and social media sites designed for teens. The irony with cyberbullying is that when technology is used to bully, there is often an identifiable electronic trail left behind (saved texts, screenshots, or social media posts provide evidence of what was said or shared), but unless kids screenshot, archive, or share with an adult, adults do not see this type of bullying. 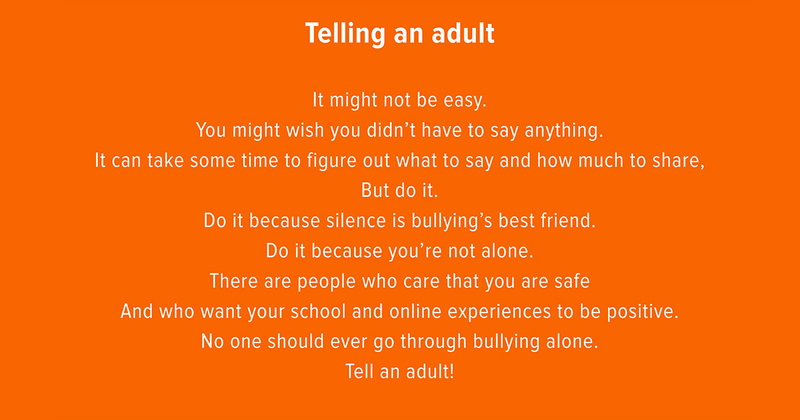 In addition to the fact that adults do not witness the bullying, the kids who are experiencing it often do not tell their parents or their teachers. Research shows that 57 percent of children who are bullied do not notify an adult at school. This lack of reporting may be due to a fear of retaliation, feelings of guilt or shame, or anxiety about making the situation worse. Students have also reported that even when they do tell an adult, they tend to minimize the severity of the bullying because it can be difficult or embarrassing to share the whole story. Because adults often don’t know about bullying, it’s especially important that young people find a caring adult to confide in. Often, bullying only stops when an adult gets involved. When someone knows what’s going on, they are in a much better position to help change it for the better.